After an extensive period of testing and trialling, Alder Hey Children’s Hospital’s unique virtual monitoring system, developed to support new parents separated from their babies, has been used for the first time. New parents Michelle and Gary Asquith became the first family to benefit from “The Lydia Project”, kindly funded by The 23 Foundation, when it was piloted earlier this month. Mum Michelle gave birth to beautiful twins Amy and Sophie on the 1st March and Amy was born with a condition called Exomphalos, which occurs when the abdomen does not develop fully in the womb. This can cause the abdominal organs such as the bowel and the liver to grow outside the body. The condition is rare, affecting around 2 in every 10,000 births and can usually be corrected with specialist neonatal surgery. 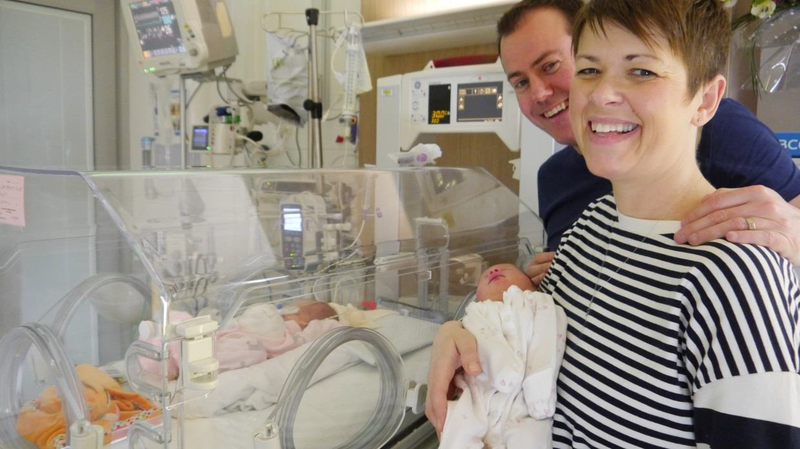 “When she was born, I only saw Amy for a few minutes before she was taken to the neonatal unit,” explained Michelle. “A couple of hours later she was on her way in an ambulance to Alder Hey. I was still recovering from my C-section at the Liverpool Women’s Hospital so couldn’t go with her, and her twin sister Sophie had to stay with me. When dad Gary came to visit Amy at Alder Hey he met Simon Minford, clinical lead for “The Lydia Project”, who told him about how this innovative solution could help Gary and other parents in their situation. We are extremely grateful to Jamie Carragher and The 23 Foundation for generously supporting this project, and we look forward sharing more updates over the next few months as this project develops.